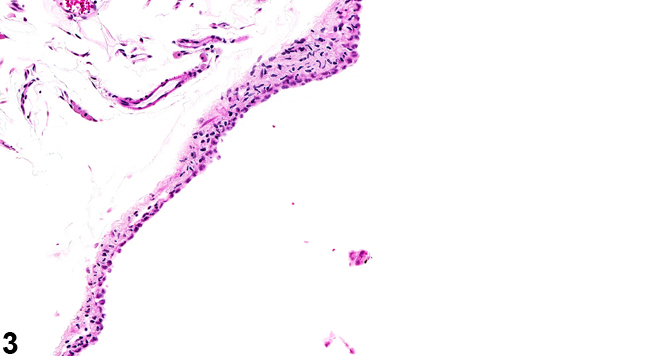 Ovary, Bursa - Cyst in a female F344/N rat from a subchronic study. A large cyst encompasses the ovary. 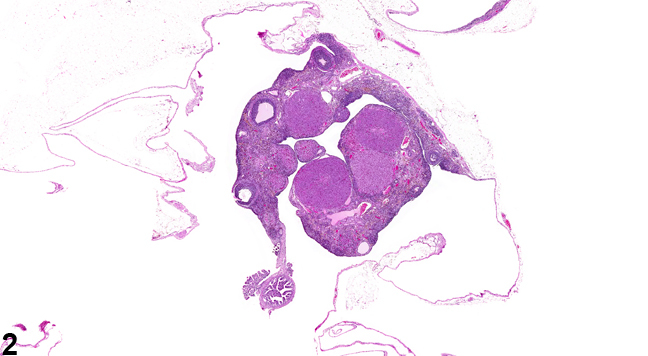 Ovary, Bursa - Cyst in a female F344/N rat from a chronic study. A large cyst encompasses the ovary. 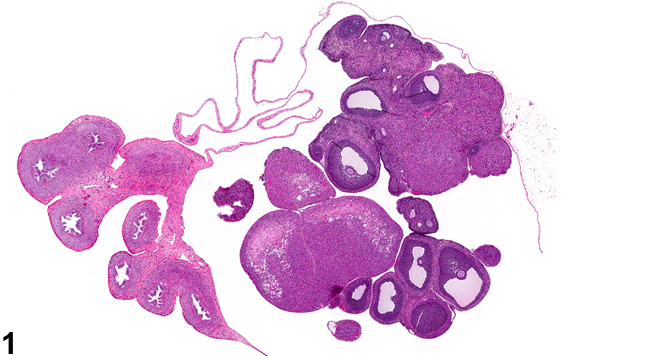 Ovary, Bursa - Cyst in a female F344/N rat from a chronic study (higher magnification of Figure 2). Squamous epithelium lines the cyst wall. Bursal cysts ( Figure 1 and Figure 2 ) are characterized by dilation of the ovarian capsule, or bursa. Bursal cysts are frequently found in aged mice and rats at necropsy. These cysts are lined by a simple squamous epithelium ( Figure 3 ). Bursal cysts should be distinguished from true ovarian or paraovarian cysts. Bursal cysts envelop the ovary and may cause compression but are not present within the ovary. Typically, a distended bursa collapses at dissection, disclosing an intact ovary within it, whereas a true ovarian cyst is found within the ovarian parenchyma and may generally be dissected intact at necropsy. Paraovarian cysts are present within and/or adjacent to the ovary and are lined by flattened, cuboidal or columnar epithelium; the epithelium may be ciliated, and a connection to paraovarian structures in the mesovarium may be seen. The pathogenesis of bursal cysts has not been elucidated. Ovarian bursal cysts should be diagnosed, but cysts occurring as background lesions need not be graded. In the case of a bursal cyst, the diagnosis should include the type of cyst/location as a modifier (i.e., Ovary, Bursa - Cyst). If the cysts are thought to be treatment related, they may be graded to fully characterize the treatment effect. If applicable, the terms "bilateral" and "multiple" may be included in the diagnosis. Dixon D, Heider K, Elwell MR. 2001. Incidence of nonneoplastic lesions in historical control male and female Fischer-344 rats from 90-day toxicity studies. Toxicol Pathol 23:338-348. Faccini JM, Abbott DP, Paulus GJJ. 1990. Female genital tract. In: Mouse Histopathology: A Glossary for Use in Toxicity and Carcinogenicity Studies (Greaves P, Faccini JM, eds). Elsevier, Amsterdam, 147-168. National Toxicology Program. 1987. NTP TR-315. Toxicology and Carcinogenesis Studies of Oxytetracycline Hydrochloride (CAS No. 2058-46-0) in F344/N Rats and B6C3F1 Mice (Feed Studies). NTP, Research Triangle Park, NC. National Toxicology Program. 2004. NTP TR-519. Toxicology and Carcinogenesis Studies of Stoddard Solvent IIC (CAS No. 64742-88-7) in F344/N Rats and B6C3F1 Mice (Inhalation Studies). NTP, Research Triangle Park, NC. Peluso JJ, Gordon LR. 1992. Nonneoplastic and neoplastic changes in the ovary. In: Pathobiology of the Aging Rat (Mohr U, Dungworth DL, Capen CC, eds). ILSI Press, Washington, DC, 351-364.